The Pontevecchio collection is the fruit of the Tuscan tradition of fine craftsmanship, the skill to make things of superior artistic and technological quality. The roots of our success go far back in time and have developed into our many treatments and finishes all done by hand. To this day, this is our answer to the demand for superior quality floors. 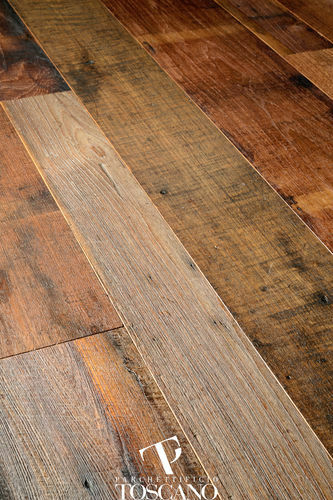 at parchettificio Toscano, we give expression to our customers’ individual tastes with our wide selection of woods, sizes and finishes, plus an option of sixteen different surface treatments and an infinite array of colors. The pontevecchio collection is truly like no other. Like a custom-tailored suit, we can respond to requests for customization at any point in the process to make adjustments, additions and variations to standard treatments and finishes.